Consider Bone Health When Deciding Between Implants and Dentures - Maritato Dental, L.L.C. Losing permanent teeth is never good — unlike primary teeth, no natural replacements wait in the wings. But the good news is you have a number of options for replacing them with life-like prosthetic (false) teeth. Today's premier choice is dental implants, preferred by dentists and patients alike for their durability and life-likeness. But because of their cost when replacing multiple teeth, many people opt for traditional dentures. And now dentures are easier to wear and maintain thanks to new, advanced materials and designs. Still, there's one major area where implants have the definite edge over dentures — long-term bone health. Older bone cells die and dissolve (resorb), replaced then by newly formed cells. Teeth help perpetuate this cycle through the forces generated when we chew that travel through the roots to stimulate the formation of new bone. But because this stimulation through a tooth ends when it's lost, new bone beneath the empty socket may not keep up with the resorption rate of older bone. As a result, you could lose as much as a quarter of normal bone width in just the first year after losing a tooth. This bone loss will continue to accumulate even if you wear dentures, which can't replicate the bone growth stimulation of natural teeth. What's more, the constant pressure on the bony ridge of the gums can accelerate bone loss. Eventually, the firm, comfortable fit you first had with your dentures will become looser and less comfortable with the shrinking bone volume. Implants, on the other hand, can stop bone loss and may even reverse it. This is because the titanium metal of an implant has a special affinity with bone cells that readily grow and adhere to it. This creates the anchorage responsible for the implant's durability, but it's also healthy for the bone. Of course, this doesn't have to be a binary choice between the two restorations thanks to a new hybrid advancement that combines implants with dentures. 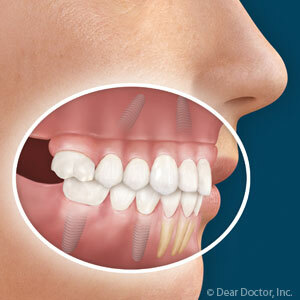 We can install as few as two implants to support a removable denture. You'll enjoy greater stability, fit and durability with your dentures, while also improving bone health through the implants. So before you decide on a dental restoration, be sure to discuss with us your implant options. Your oral health and appearance could benefit immensely.